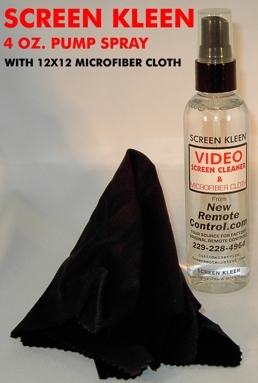 SCREEN KLEEN For Rear Projection TV screens, LCD screens, computer monitors, or most other electronic display screens. Finally a Projection TV Screen Cleaner that really works and is safe to use. Bio-degradable, pH neutral, organically based, and non-corrosive. Includes a 12x12 micro fiber cloth that absorbs oils and removes debris. Proprietary anti-static formulation originally created for the optical industry. Residue-free cleaner picks up fingerprints. This is the same product supplied as an accessory by some major TV brands. Why not just use commercial glass cleaners? Most consumers and sales people are unaware of the effects of common household cleaners on expensive projection TV screens. Some are corrosive or will smear on a screen, and soapy water leaves a film. Other more harsh chemicals can actually destroy the screen. Our service center has replaced screens damaged by gasoline, lighter fluid, acetone, and several unidentified chemicals. The lenticular and Fresnel screens on a rear projection TV can cost anywhere from $200 to $600 and more to replace. Even if you don't use Screen Kleen only use cleaners designed for the job. So what's a little dust on the screen? The harmful side of having dust on any TV screen or computer monitor, besides obscuring the picture, is that most of these dust particles contain harmful chemicals that are airborne in homes and stores. Many of these airborne chemicals come from normal household cleaning agents such as ammonia or from chemicals used to clean carpets. These chemicals are corrosive and with time can cloud a plastic projection TV screen. Screen Kleen will not correct for scratches or screens damaged by other cleaning chemicals. Tip 1: Use Caution And Reason When Cleaning Rear Projection TV Screens. Plastic screens are easily damaged. The only user serviceable part of a rear projection TV screen is the outer viewing portion. Many rear projection TV's will respond well to mirror or CRT cleaning, but any internal cleaning should be referred to qualified service personnel!!! Under normal circumstances there should never be a reason to separate the lenticular and Fresnel screens to clean between them. Tip 2: When Cleaning Glass Direct View CRT's, Never Spray Liquid Of Any Type Directly On The Screen. Spray liquids on a rag and wipe the CRT with the damp cloth. Liquid that drips under the picture tube can cause severe damage to your set in the form of shorts or corrosion.